Swap tiles to form words. Score points to earn more swaps. 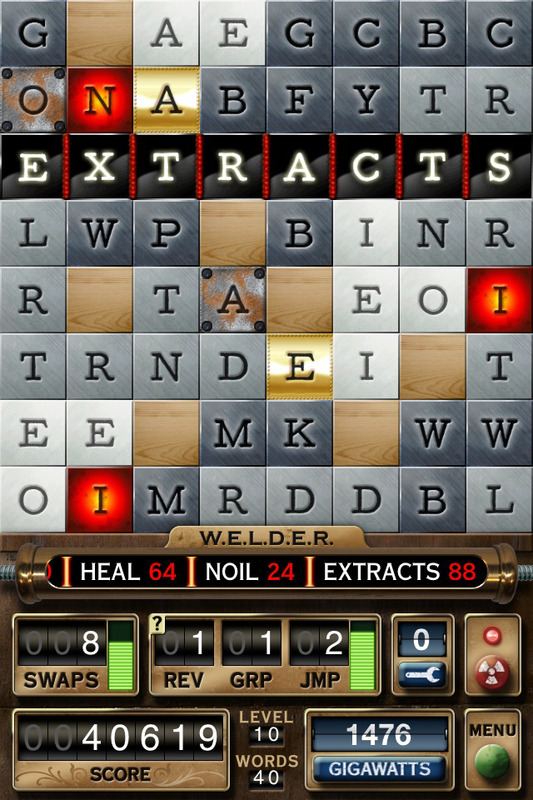 Weld words in the word machine for 30 levels, plus 5 bonus modes and a multiplayer challenge-- your lexicography will be tested to the fullest! With unique features like reverse swaps and group swaps, dictionary lookup and word challenges with your friends, and iCloud support to share your game across devices, W.E.L.D.E.R. 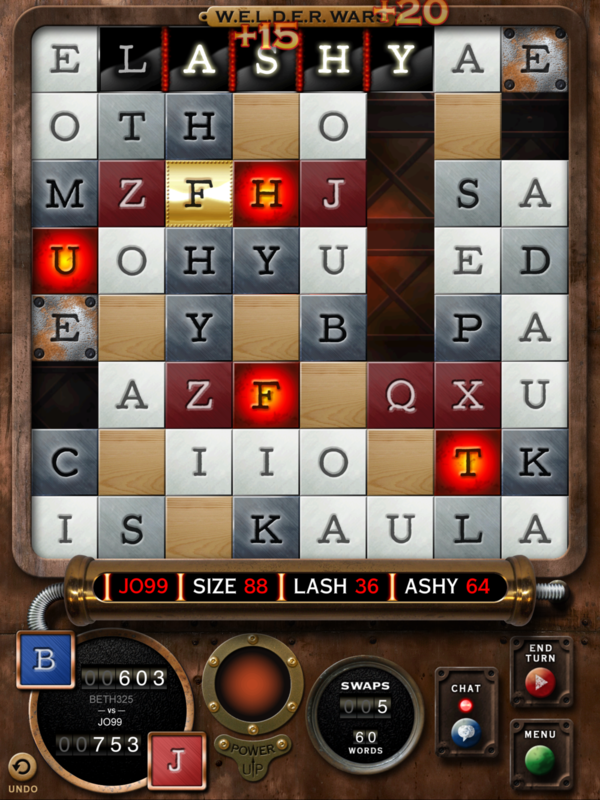 is the wordsmith's word game on steroids. Awarded Game of the Week by Apple, Nov 3, 2011. #3 on Mashable's Top iOS apps of 2011. #19 in TechCrunch's Top 20 iOS games of 2011. Made Bob Tedeschi's list of Top 10 iPhone games of 2011. Made AppAdvice's list of Top 10 paid iPhone apps of 2011. For thy King! Battle monsters, match-3, avoid the giant wall of spikes! Thy King has chosen YOU, young Knight, to go on a Maze Crusade! Match wits with evil gnomes, henchmen, gargoyles, ghosts, and sorcerers as you are being chased by a rolling wall of SPIKES through the treacherous maze! Solve the puzzles in the maze by matching items to earn bombs, spells, towers, and magical rewards! Cast spells to become invisible, freeze the maze, earn magic armor and more! Get awesome weapons upgrades like a mace and the Super Pulse! Build towers to hurl arrows and fireballs at your foes! Connect to Facebook and Game Center to loot your friends who have died in the maze. Nine maze worlds including a garden, a forest, a dungeon, and a swamp. Cast spells in the maze including invisibility, super pulse, and maze freeze! Collect stones to build arrow-shooting and fireball-hurling towers in order to stop your enemies in their tracks. Get special powers to gain magic armor and ride the powerful horse! Defeat the sorcerers, skeletons, henchmen, evil garden gnomes, wolves, and gargoyles! Complete over 60 dangerous crusades to bring honor to your King. 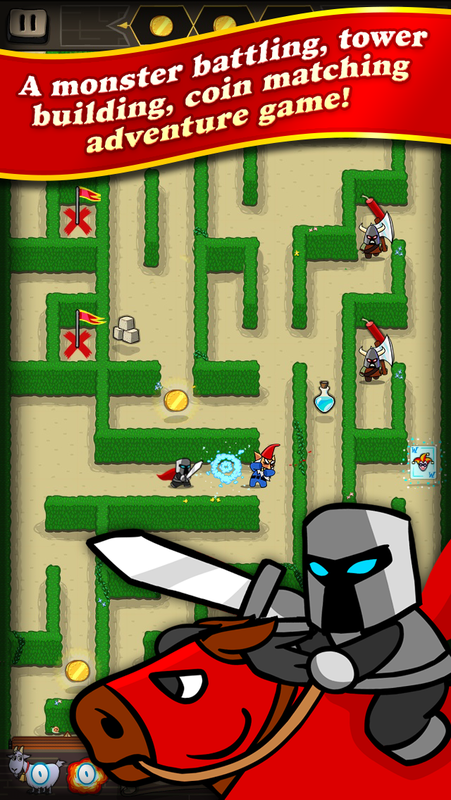 Upgrade your spells and weaponry to become the most powerful Knight in all the land! Over 100 lines of voiceover narration as the Knight reflects on his journey through the maze.